For your Friday enjoyment, a couple of random office pictures. 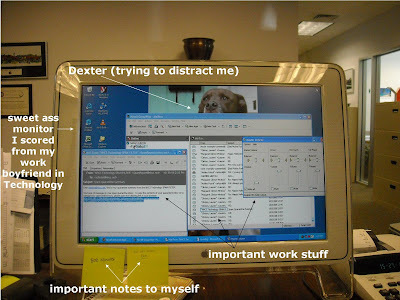 Dexter, stop distracting me. Some of us have to work for a living. 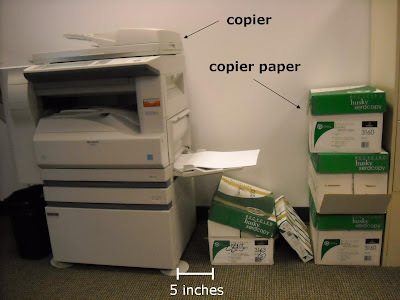 Coworker: Hey, Sarah, do we have any copier paper? I love that picture of Dex. That's either an urn, spitoon, or plant holder above your monitor but if there's a plant in it, I think we should call for last rites. Then again, there's that plant in the office to the right but I think it's doing fine. What's with the traffic cone icon on your desktop? dingo - That is a flower "pot" a co-worker gave me with a single re-potted philodendrom tendril in there. I tried to refuse the gift, but she insisted, and now she waters it along with her plants. so - It's my dvd player icon. I don't know why it's a traffic cone.